Sese Seko Ngbendu Waza Banga Mobutu, originally known as Joseph Desire Mobutu, served as Patrice Lumumba’s private secretary before being appointed Chief of Staff and second in command of the army when the Congo received its independence in 1960. 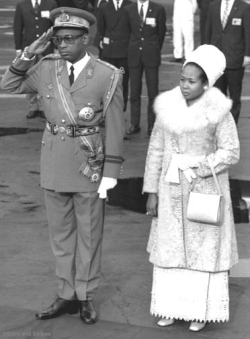 In November 1965 Mobuto led a coup which made him President of the Congo. In the address below, given at Dakar, Senegal on February 14, 1971, Mobutu described his rule in the Congo. The M.P.R., A NATIONAL, POPULAR AND REVOLUTIONARY MOVEMENT IS A MOVEMENT FOR ACTION ARISING FROM THE CONGOLESE EXPERIENCE. Some of you may be surprised that the President of the Democratic Republic of the Congo leaves his country so frequently to visit his brothers elsewhere in Africa. One could even ask if we really like our own country… The answer, as you suspected, is positive. We like our beautiful country a lot; but, if we have set our hearts on visiting all our brothers in independent Africa, if we consider it to be a sacred duty to commit ourselves, body and soul, to this genuine crusade of friendship, it is not only because we must maintain the links which unite our states and peoples, but also because we are inspired by the will to restore to our country the place that it had in the heart of the African community which it lost through the policies of the leaders who were in power before us from 1960 to 1965. Since 24 November 1965, I have had to carry both within the interior of my country and abroad innumerable messages of peace and fraternity to the Congolese people and our African brothers. I have also had to dispel the distrust which for a long time has surrounded a country which some people like to refer to as ‘the sick man’ of Africa. Today we can legitimately be proud of the esteem and friendship which we are happy to find everywhere: on the banks of the Nile, Lakes Tanganyika and Victoria, around the Ubangui, the Niger, the Chari and the Sénégal, or on the shores of the Atlantic sea, which bathes your coast as it does our own. But this sacred duty of visiting our beloved African brothers enables us, throughout the five years of our mandate, to discover from the wise men of our continent knowledge that we could never have learnt from the industrially developed countries—And I have always set my heart on taking note of the experiences that each of my brothers have promoted through the spirit of their people, by endeavouring to apply them to enhance our development through our own methods. Our experience was at first based on the search for a method, which I believe we have now found. We certainly do not intend to make this method into a recipe that we expect to see everyone adopting, we would not presume to make this claim. But we feel we have the right to explain to our African brothers the way in which we have organised the life and development of our country. And it is this that I would like to talk about today with the militants of our brother party: the Union Progressiste Sénégalaise. In the Congo, we have always been convinced that to have any real experience of work in a developing country, one should look first of all within the developing country, and not import such methods which work in countries benefiting from a long period of technical development. The complete significance behind our quest, our effort and our pilgrimage on this African continent is that we are in search of our authenticity, which we shall find because we wish, through every fibre of our inner being, to discover more about it each day. In a word, we other Congolese wish to become authentic Congolese people. Who can understand better than you, Mr. Secretary General, the importance that we attach to the search for our authenticity; this discovery of the true African spirit, such as it was fashioned day after day by the ancestors to whom we owe the noble heritage of our great African fatherland? If we wish to hope that international organisations, created to defend the interests of the Third World, whether they are purely African, or Afro-Asiatic, may be inspired by true, cohesive forces, each of the countries of which it is constituted must victoriously accomplish the return to their authenticity. This seems to me to be a fundamental condition to which we should pay a lot of attention in the struggle for development. For it is useless to compare what happens in our country, for example, with situations in South Africa, under the single pretext that South Africa and Black Africa are both parts of what has been called the Third World: the Third World being, if I may draw attention to this piece of terminology, an expression invented not by the inhabitants of the Third World, but by more or less well meaning experts of a certain industrialised world which they hope we shall one day resemble. Thus the theorists of the old and new world are accustomed to passing definitive judgments on the standard of living of the Third World countries through references to the criterion of per capita income. It comes, however, to mind—is this not indeed proof?—that this criterion is far from being absolute, that no one obliges us to accept it as the only yardstick enabling one to say that a certain country is developed or underdeveloped. No, it seems that we should consider the experiences of people who have had the same difficulties as us. And there it is easy for us to recognise that these difficulties are very little more than the same from one end of our dear continent to the other, in so far as we Africans have usually experienced the same basic situations. We were born into a family which is the core of our society. We have grown up in a village under the direction of a village chief, we have been colonised at about the same time by Europeans with roughly the same good and bad qualities. We experienced decolonisation at practically the same time. And we have simultaneously seen the dawn of neo-colonialism breaking, so as to speak. The consequences of all this are that in each of the new states, with few variations, we have been able to discern the same difficulties after independence, difficulties that each of us has tried to overcome in his own way, in most cases more or less successfully (though sometimes not at all). For us, the Congolese people, it is enough to believe that if we have lessons to draw from somewhere, we should look towards our African counterparts. In one place they have a good understanding of agricultural problems, but in another why haven’t they? In one place they have succeeded in establishing a framework for the masses through a national party, and in another this has been a failure. Everywhere each of us has something to learn from each other, and this, in my opinion, is essential. First of all the Congolese experience since 24 November 1965 bears deep reflection. Perhaps some African countries exist which have reached independence in trains which ran quite well, but which were at least in working order. They were shown how they worked, and, after a certain time, they were left with directions, along with best wishes for the journey. But if trains of this kind have existed, we, for our part, did not find them when we became independent, and I can admit today that my companions and I did not embark on this kind of train in the early morning of 24 November 1965. We unfortunately have not found our poor Congolese train in the ravine. But for us it was even more serious than that. It was not the rails which were in bad condition, nor the mechanic who was drunk, nor the carriages badly maintained, but in our trains of 1965 everything was in pieces, scattered here and there on the line and we had to put these pieces together in order to get this train into working order again. And so we have dared to take this in hand, and, let me tell you, this called for a lot of courage! We found ourselves faced with a different situation from many others and so our method consisted in dividing up the problem into sectors. This led to an initial commitment to resolve our problem of internal policies, then of foreign policies, the economic sector, and finally the social sector, of course. In the field of internal policies we have done the opposite, I admit, to that which others had done previously and which I believe to be rather fashionable. Indeed, decentralisation and regionalisation are talked about a lot nowadays. A policy of decentralisation or regionalisation is good in so far as each of the entities that have been created are viable, or can be made viable. But in so far as we were concerned, we found ourselves faced with a Congo which had been divided into twenty- two little provinces which were not viable, even if, from a geographical point of view, each of these entities (that are referred to locally as ‘provincettes’) represented a geographical area comparable to that of certain states which we know, but which are themselves perfectly capable of existing on their own. It therefore very quickly dawned on us that we should rebuild national unity, through cutting down our provinces from twenty- two to eight, a figure which corresponds to our economic as much as our sociological realities. Following our analysis of the problem with which we were confronted, we saw that one of the plagues of our community life, and the principal cause of anarchy, was the freedom which had been left to any of the twenty-one million Congolese citizens to form a political party. This policy of allowing parties to be formed, from which each of us has suffered, was promoted by people from developed countries on the basis of what they call individual rights. It is in the name of these rights that forty-seven political parties were created in our country of which a certain number being born in the night did not see the end of the following day, because they did not reach beyond the confines of their ethnic group or family. But having examined the question meticulously, we have been able to comment that the harbingers of the developed countries, who like to speak about the plurality of parties and individual rights, are much less generous when they have to face up to the flowering of parties in their own national sphere. And it is thus that the Anglo-Saxons, most of the time—and who can claim that Anglo-Saxon democracy is not true democracy?—the Anglo-Saxons, therefore, frequently show us the spectacle in their own country of only two parties. Hasn’t it ever struck you, for example, that the United States of America, who pass in the eyes of the whole world as the model of democracy, has only two political parties? And then, doesn’t it come to mind that in our African tradition, there are never two chiefs? There is sometimes a natural heir to the chief, but can anyone tell me if he has ever known an African village where there were two chiefs? This is the reason why, we Congolese, in our concern to conform to the traditions of our continent, have resolved to group together the energies of the citizens of our country under the banner of a single national party. It is the same concern for authenticity which has prevented us from forming our policies according to orders from any foreign interest. In the Congo, a chief must, and this is a necessity, seek council from the wise men. He must be informed, but after taking advice and getting information, he must make up his own mind and settle the question alone, in full knowledge of the facts. For it is up to the chief to make his own decisions, to evaluate the situation and to suffer the consequences. He will only be able to do this because he himself will have given the problem due consideration It is on this condition alone—because he will have weighed up the consequences in advance and accepted full responsibility for all the risks of his choice—that the decision he takes will be honest, hence in the interests of his people and authentically democratic, according to his interpretation. But if the chief lets a solution be imposed by someone else, this solution will always be suspect because this adviser will not have to live through nor give due consideration to the chief’s decision, and he will not, in any event, have to pay for the damage. Above all, you can always, on looking closely at this solution (which suggests a prompter), expose a personal interest, that is consequently not your own, and even less that of the people whom you have set your heart on guiding towards happiness. In other words, you will have been a marionette controlled by the strings which prompt you. In our choice of internal policies adapted to the needs of our people, we have always realised that our masses needed to have certain information relevant to their situation and a genuine social infrastructure, and that it was impossible to govern a state without the existence of one party. We have therefore formed a national party. We have called this a ‘movement’ rather than a party because it was designed to sustain the movement of ideas drawn from our commitment to permanent action. We have used the word ‘popular’ to qualify this movement to show our concern that it should involve the entire population. And finally, we wanted this popular movement to be the ‘popular movement of the revolution’, M.P.R. * so as to immediately publicise the new significance that we want to give to our actions, which imply a break and a change, a total break and a radical change in relation to preconceived ideas and methods, which had failed before we came to lead the Congo. It is significant to note that even the method adopted for the creation of this movement is revolutionary. Indeed the M.P.R. is not an amalgamation of two or more political parties, but an original movement created from the Congolese experience, this experience drawn from the anarchy caused by the plurality of political parties and by the ascendancy of imported ideologies, spread through empty slogans. We have had to wipe the slate clean of all previously existing parties. The M.P.R. is a movement for action. However, we have stated that unity for this action must be guaranteed, that we should make principles and hard and fast rules. We have elaborated our doctrine from our experience, a doctrine which should respond to our concern for authenticity: we have adopted the doctrine of authentic Congolese nationalism. Our nationalism, which is centered on the Congolese man, is an aggressive humanism, a communal humanism, an effort, even a sacrifice, in order that the national community may flourish. This doctrine should provide for us an effective arm for fighting this plague which has spread to all African countries: the absence of national consciousness. This difficulty for our people to feel part of a single nation is indeed understandable: national boundaries, delineated in the nineteenth century by our colonisers only respond to their own interests and did not correspond to the logic and feelings of our populations. And it is in this way that a population was often cut in two, and it was not unusual to find families divided into two different linguistic zones on both sides of the frontier. Nor was it unusual to find a mixture of ethnic groups, who did not necessarily get on well together, limited by the same frontiers. In consequence, it sometimes needed a trivial incident for problems to appear, problems which in certain situations took on the dimension of actual bloody secessions, only to the advantage of neo-colonialists. We have, we Congolese, suffered too much from this to run such risks again: this is why we have, without the slightest delay, consecrated all our strength in forging national consciousness. And we can state that this national consciousness is today spread throughout the expanse of our vast territory. Having resolved our problem of internal politics in this way, we undertook to define and apply a foreign policy which was and is marked with the stamp of the same realism. For these reasons, our foreign policy will have been above all a crusade of friendship. And because we are realists, our crusade of friendship has lead us first of all towards our African neighbours and brothers. We have considered that we could not like the Chinese before liking the Central Africans, the Brazzavillians, the Sudanese, the Ugandans, the Rwandans, the Burundians, the Tanzanians, the Zambians and the Angolans. We have thus searched for a good understanding with the countries bordering our own. And these countries have, without exception, become the Congo’s friends. This is the true significance which we have always wanted to give to the idea of African brotherhood. And this significance has, happily enough, found its justification in the reciprocal attitude that our initial step has aroused among others. We have also taken care that our foreign policy does not involve the slightest interference in the policies of others; and it should be said that we were the first to understand this concern for noninterference. Indeed, we have suffered more than any other nation from outside interference in our own affairs. Proceeding in this way, we have discovered that our policy of good neighbourliness and good relations inevitably leads to an active policy of cooperation. For how could we admit, for example, that the eighteen African and Malagasy countries associated with the European Common Market do not meet among themselves and only have provision for co-operation in the framework of this single community, unless there exists relations and markets between them? We have therefore equally made this priority of inter-African relations the ‘leitmotiv’ of our economic contact. Obeying this principle, it seemed to us that we could only aim to have a genuine feeling of ‘African-ness’ in our contact with brother countries if we first of all became masters of our own destinies in the economic field. We therefore had to have absolute responsibility for our economy, which unfortunately had not been the case up to 1965. We have always considered that political independence has no true content without economic independence. And I repeat, this economic independence doesn’t wish to imply living in a vacuum or retiring within oneself or even shutting the door on others, but only to live as master of the orientation of one’s economic policy. In this sense, we can say with complete modesty that we have succeeded: this economic independence exists in the Congo. The scepticism, or even pessimism engendered by our struggle for economic independence has been dispelled by the expansion that we are experiencing at the moment in all sectors of our economy, something which appeared to be unthinkable until now. We believe then that we can say, from now on justifying ourselves through the experience acquired in the five years’ struggle for our independence of mind and economic expansion, that it would be very wrong for us Africans to consider ourselves as unfortunate men because we do not see the appendages of the notion of the so-called developed countries around us. And this is a question that I should like before ending to consider for a moment with you. We have given ourselves the task of harmoniously achieving our development. But this concern for harmony forces us, as I interpret it, not always to follow those for whom development and happiness consist in having a television today, a colour television tomorrow, and in believing themselves obliged the day after tomorrow to curse and swear because they do not possess the latest television model, whether it be in black and white or colour, with an electronic operating system. If these fruits of the technological age are nice to taste, they are not sufficient in themselves for our happiness. Is it not striking that precisely the most aware of the thinkers in those countries which are currently the best equipped concentrate their interest on denouncing the dangers and crimes of a technological civilisation which no longer allows man, the human, or humanism, the role which is his in a harmonious society? One of these thinkers, the American writer Alvin Toffler,—and it’s not just by chance that he belongs to the most technologically advanced country of the modern world—has just dedicated a complete book warning his contemporaries to be on guard against what he calls the ‘shock of the future’. And he gives us Africans, through this, the opportunity to rejoice at living until now sheltered from such excesses, from these hypertrophies of material progress without any parallel spiritual development. This shock of the future can take on the appearance of riches which leads the nouveaux riches to suicide because their lack of preparation does not allow them to see any meaning in their money. In a general manner we could say that we feel threatened each time that a change in our way of living finds us without any preliminary defence. We do not need extensive developments to realise that I have put my finger on the danger which threatens us and our developing country, if we are not concerned to prepare our populations to assimilate the fruits of material progress, through the preservation of the spiritual heritage which we have inherited from our ancestors. It is this concern that we are nurturing in our national Congolese party, the Mouvement Populaire de la Revolution, through action orientated precisely towards helping our citizens to assimilate innovations quickly and t& welcome the achievements of material progress painlessly. This sensible and objective information system, systematically renouncing illusions, depends at first on the wisdom which consists in satisfying oneself with what one has, without however abandoning the desire to increase one’s belongings. While it may be true that we have not always the means to travel at supersonic speeds, it is no less true that we have not got to suffer from the harmful effects of eternal pollution! I wish to show through this illustration that our situation in a so-called underdeveloped or developing country often carries worthwhile advantages. We therefore have to take these things into consideration and to prepare ourselves for the twenty-first century. In choosing from among the benefits of progress, our actions call for those things which will not destroy our art of living, this way of being African that the whole world envies. Thus we have no hesitation in Kinshasa in soon inaugurating a station for communication by satellite, because we know that it will enable us to instantly communicate with the world, without generating at the same time this atmospheric pollution which for years has been in the headlines of the newspapers of the industrialised world.